Glycolysis and the Krebs cycle both generate the high-energy compound adenosine triphosphate ( ATP ) directly, by substrate -level phosphorylation, but this represents only a small fraction of the energy in each glucose that passes through these pathways. Much more of the energy in glucose is conserved in the form of high-energy electrons carried in pairs by the electron "shuttles" NADH and FADH 2 , which are generated in glycolysis and the Krebs cycle. In aerobic cells, these high-energy electrons are used to produce more ATP by oxidative phosphorylation, a process during which the electrons are passed to molecular oxygen via an electron transport system (ETS), giving up their energy along the way. This energy is used to phosphorylate adenosine diphosphate (ADP) and inorganic phosphate to ATP in a process called chemiosmosis . In eukaryotic cells , oxidative phosphorylation takes place on the inner mitochondrial membrane; in prokaryotic cells, it is associated with the plasma membrane. The remainder of this discussion will refer only to mitochondrial oxidative phosphorylation, but the process is similar in prokaryotes. 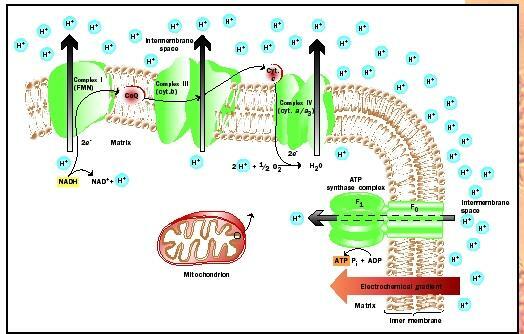 The ETS consists of a chain of electron carriers, associated with the inner mitochondrial membrane, that bind electrons at successively lower energy levels. The energy released as the electrons are passed from carrier to carrier moves hydrogen ions (protons) across the membrane, from the mitochondrial matrix to the intermembrane space, creating a concentration gradient of protons. Since the protons carry a charge, an electrical potential (voltage) also develops across the membrane, so the gradient is often called an electrochemical gradient. This electrochemical gradient is a form of stored energy, some of which is used to phosphorylate ADP to ATP, a process carried out by a complex of proteins called ATP synthase. As protons move down their concentration gradient, from the intermembrane space back to the matrix, the energy they release is used by the ATP synthase complex to phosphorylate ADP. Illustration of the chemiosmotic synthesis of ATP in the mitochondrion. them to complex III. Cytochrome c, a small peripheral protein, receives electrons from complex III and transfers them to complex IV. Several other cytochromes are included as members of the four electron-carrier complexes. Cytochromes are a class of small proteins containing heme that are important in transferring electrons in cellular processes. There are three sites along the ETS where protons are pumped across the membrane: complexes I, III, and IV. At each site, one proton is pumped across the membrane for each pair of electrons that passes through. Since each proton that returns through ATP synthase phosphorylates one ADP to ATP, each pair of electrons passing through the ETS can produce at most three ATP molecules. Electron shuttles such as NADH or FADH 2 carry pairs of electrons at specific energy levels, as do the carriers in the ETS. Electrons cannot be passed to a carrier at a higher energy level, so these shuttles pass electrons to different points in the ETS. NADH donates electrons to the highest energy carrier, complex I, whereas FADH 2 donates electrons to complex II, which can accept the lower-energy electrons it carries. Because one of the three sites that pump protons across the membrane, complex I, is bypassed by the electrons from FADH 2 , these electrons can ultimately produce only two molecules of ATP whereas those donated by NADH can produce three. This is consistent with the idea that FADH 2 carries electrons possessing less energy than those carried by NADH. ATP synthase is a large complex of proteins that is imbedded in the inner mitochondrial membrane. It consists of two parts: an integral protein complex that serves as a channel through which the protons cross the membrane, and a peripheral complex that phosphorylates the ADP to ATP. As the protons pass through the integral complex, they cause the peripheral complex to rotate. In a manner that is not completely understood, this mechanical action provides the energy needed to phosphorylate ADP. However, it seems that the rotation of the peripheral complex is necessary. This complex is made of six subunits, arranged in three identical pairs, each of which can bind ADP or ATP. At any given time, one of the pairs will be empty, one will bind ADP and phosphate, and one will bind ATP. As the complex rotates, the site binding ADP and phosphate passes a stationary extension of the integral complex, which causes that pair of subunits to change shape. The result is that the ADP is phosphorylated to ATP. At the same time, the ATP that was bound by the other pair of subunits is released, and the empty pair of subunits picks up ADP and phosphate, rendering ATP synthase ready for the next step. Altogether, for each complete rotation of the peripheral complex, three ATPs are generated. The pathways for oxidizing all food molecules— carbohydrates , fats, and amino acids —unite at oxidative phosphorylation. All these pathways produce NADH, which donates electrons to the ETS. The ETS and oxidative phosphorylation are thus versatile and ubiquitous pathways in all aerobic cells, and even in some anaerobic bacteria. Many such microbes use a similar mechanism to generate ATP, but in the absence of free oxygen they pass electrons to other acceptor molecules, such as sulfate or a variety of metal ions, thereby generating significant ATP in the absence of oxygen. Hinckle, P. C., and R. E. McCarthy. "How Cells Make ATP." Scientific American 238 (1978): 104–123. Stryer, Lubert. Biochemistry. New York: Freeman Publishers, 1995. English chemist who won the 1978 Nobel Prize in chemistry for discovering how the mitochondria (organelles of most eukaryotes) in cells make energy. According to Mitchell's "chemiosmotic theory," cells form the energy-rich molecule adenosine triphosphate (ATP) by means of chemical and electrical gradients. what are the assumptions made during the calculation of net gain of ETP ?